Basotect melamine foam is a flexible, open cell foam made from melamine resin, a thermoset polymer. It has high soundabsorbing capacity and good thermal insulation properties. Basotect melamine foam inherently has excellent fire, smoke and toxicity (FST) properties that meet rigorous aerospace fire standards. 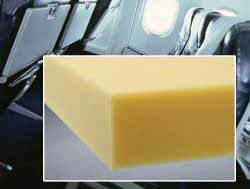 Basotect UL melamine foam exhibits an ultra-low density of 6 g/l (0.37 lb/ft3). Basotect UL melamine foam can be used for the thermal and acoustic insulation for sidewall panels and bulkhead structures. It makes a positive contribution to the rising demands for better noise reduction while lowering the weight in aircraft construction. In addition, Basotect panels are selfsupporting for easy fit and rapid installation. Assembly time of the aircraft can thereby be reduced. The low density and thermal insulation properties as well as the favorable fire properties of Basotect UL melamine foam make it the material of choice for duct insulation. Basotect UL melamine foam is also used for cladding the payload section in the nose cone of rockets for the protection of sensitive satellites from the high ​acoustic pressure exerted on the rocket during liftoff. Three properties are key features for the use of the thermoset polymer in this application — the lightweight foam has a high sound absorption capacity, is very flexible at a high range of temperatures and is easy to mount and install.